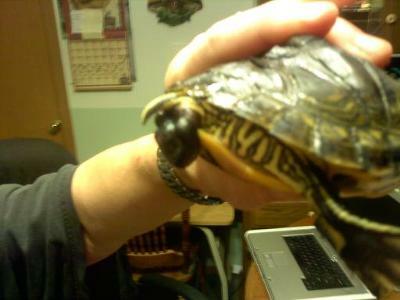 i think my turtle has a prolapsed colon. he is only about an inch in diamitor and is still small. i have only had the pair for about 6 months. they have been eating well and he seems to have a thing for the pellets rarther and the female prefers blood worms. i alternate one day one day. how do i fix his problem and what are his chances of getting an infection. You did the right thing in going to the vet. If any problems happen from the stitches or anything else, go back to the vet. That is where you will get the best treatment. even my turtle is facing the same problem as shown in the picture.i took him 2 vet and he pushed that organ back and gave stitches. i m worried. will you please suggest me what to do? Copy and paste the URL into your browser window. After you look at that photo, could you come back here to tell us if you agree? Diagnosis can be a little tricky even with a photo. This next link is very technical, but it deals with intestinal prolapse, which would be red. As you will read, it requires medical attention. Again, can you please post back to tell us what comes of this situation?